Here Comes The Sun? Ed Paul Is Not So Sure. This morning’s “06880” post involved energy costs. This one does too — specifically, solar. Solar energy is getting plenty of press. His curiosity piqued, alert “06880” reader Ed Paul signed up with Westport’s Green Task Force. He wanted to learn about installing solar panels at his house. A company called Astrum provided a proposal. Ed was stunned at the cost: over $51,000 — after rebates and incentives. Based on his current CL&P bill, the system would save about $3,500 a year. At that rate, it would take over 14 years just to break even. He wonders if his situation is unique. He’d like to hear from other “06880” readers. If you’ve gone solar, did you do it save money? Or was it simply an environmental-based decision? “I’d love feedback from solar users on their experiences and cost savings,” Ed says. Click “Comments” to share your thoughts. And — in the spirit of sunshine and openness — please use your full, real names. This entry was posted in Environment, Organizations, People and tagged Antrum, Ed Paul, Solar energy, Westport Green Task Force. Bookmark the permalink. I had a solar appraisal done on our home a couple of years ago. We have a lot of roof that could be fitted with panels. But we didn’t even get to the cost part. The survey crew said not only would every tree surrounding our house need to be cut down, but so would our neighbors’ trees and the neighbors beyond them — to get enough sunlight to generate energy. Full stop. In 2008 we had solar panels done (5kw). The total cost was estimated at 42k, however, the state of Ct subsidized this to the tune of around 20k (based on wattage and efficiency.) My husband’s employer also arranged for a reduction of around 1K. Then we also got around 7 or 8k worth of tax credit. So that brought the direct cost down to around 14K. However…. we had to have our roof repaired, and then it turned out we needed some chimney work, so that brought things back up again to about 19 or 20k. In general we knew all this up front but have taken the long view. However, the equation is very clearly not attractive. It really seems like a lost opportunity when the cost of improvement so far exceeds the returns. I find Ed’s story surprising. We installed solar panels last January as part of the Solarize Westport program. Encon, Westport’s chosen supplier for the program, installed a 32-panel, 10 KWH system (twice the capacity of Ed’s system) for a total cost of just over $35,000. With state rebates and federal tax credits, our final cost was about $12,500, with a payback of under seven years (closer to six if rates go up again). In the past year, we generated an average of over a Megawatt Hour of electricity a month, or about 90% of our annual energy usage (which we’re still trying to reduce further). I have no idea why Astrum’s system should cost so much more, although I hear that their panels are the newest technology and slightly more efficient than the ones we have. Yes, panel efficiency declines over the years, but I’m convinced that we’ll have more than ten years of virtually “free” electricity. To me, our biggest compromise was to take down two old maple trees (I consoled myself by using the opportunity to also eliminate the threat of several scary-tall pines!). Otherwise, I’m very proud of our commitment to doing our part to reduce our carbon footprint and keep the focus on renewable energy, which is our only long-term hope as a planet. Full Disclosure: I’m Vice-Chair of the Legislature’s Energy & Technology Committee and a true believer when it comes to energy efficiency and renewable energy. So I’m pretty biased! Thanks Jonathan for your info. I was quoted a 16kwh system (large roof coverage), so the cost is higher. Perhaps the rebates and discounts are different now. There was a $10k state rebate. You get a tax credit, if applicable to your case, of up to about $14k. The savings estimate I was given was calculated by Astrum on a much higher cost of generation than I’m paying now. My $3,500/year listed savings is based on my generation and distribution cost/kwh on my current CL&P bill’s rate. Of course, if (when) costs rise, the savings will also, but who knows how much that will be in the future? $51k is a high cost to go green! The inconvenient truth is that the math doesn’t seem to work. A pioneering neighbor gave me a tour of his installation a few years ago (back when the rebate was much higher) and he came up with a near 20 year financial ROI for the installation. But surely there will be tons of changes in costs and efficiency over the course a decade, so I’d guess waiting a few years would shorten the ROI. Then he wistfully mentioned that he had to take down two huge and beautiful black walnut trees that were blocking the sun. I thought he was joking, but they came down the next week. Not doing the carbon math, it sure is a net negative on the aesthetics. Then he showed me a full 1,000 lbs of lead batteries needed to store the electricity. From what I know mining, transporting and disposing of lead is a big negative (which the car companies don’t talk about.). Absolutely ok. THANKS, Dorrie. “06880” is all about sharing information and experiences. This is a great and important discussion, which hopefully sheds a ton of “light” on an important subject. We participated in the Solarize Westport program in 2012. Encon installed a 5 kw system. Cost to us after all credits/tax rebates was $6000. We used to pay CL&P $160/mo. Only when we use a/c in summer do we have a bill greater than the $16 minimum due CL&P. Solar electricity is generated even on cloudy/misty days. What we don’t use is sold back to CL&P….kinda like rollover minutes on the cell phone. Generation definitely goes down in winter when days are shorter but still enuff to cover most of what we use. Right now we are “banking” kwh for July/Aug a/c season. Payback in probably 6 years. I’m totally sold on it……BUT…..you house has to be positioned favorably with no tree interference. Ours was. We also worked with Encon 18 months ago as part of Solarize Westport. We put in a 5KW system. Cost after incentives and tax credits worked out to about $6000 out of pocket. We didn’t have to take down any trees, though we live in a wooded area in NE Westport. The installers were able to come do a site survey by putting a special camera on the roof and collecting data which they were able to use to predict the amount of annual sunlight, taking into account roof direction and shading from trees. We’re getting slightly less than the projected generation, but expect the payback period to be about 8 years based on the savings from the first year. Note that our system does not include any batteries. Instead, it’s a grid tied system, where any excess electricity we generate goes back into the grid, essentially turning our electric meter backwards. We get credited each month for the electricity we put into the grid. The downside of this is that the system shuts off if we lose power, so we can’t operate the house on solar in the event of a power outage. Adding the batteries increases both installation costs and maintenance, as batteries need to be replaced periodically. Our panels came with a 25 year warranty, guaranteeing to provide a 80% of the initial power after 25 years. We’ll have returned our investment dollars many times by that point. We put this system in partly for the economic benefit, and partly to reduce our carbon footprint. I am going through this process now with Astrum and will let you know what the salesperson tells me this weekend. I looked at the Solarize Westport program and noticed that Encon did a LOT of installations and many of them were sub $10k after the incentives. Unfortunately, that program is no longer in place. For that price, I would totally do it but I am not interested in something that is over a 10 year payback. Looking at getting an EV car and I find the idea of free energy for the car and home intriguing. How is the energy “free”? You pay for the solar panels. They have a finite life, and they represent a capital investment with an opportunity cost. 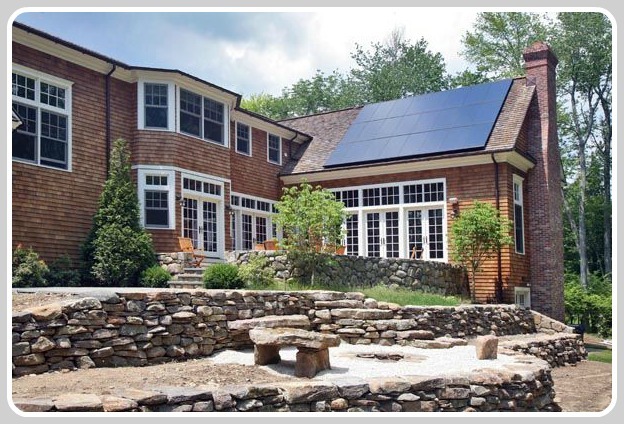 If you can get a 5kWh system for $6k, your energy would be virtually free after 4-5 years. That’s not bad, but I don’t know if you can still get that size of a system for $6k anymore. The panels have a finite life. They must be replaced at some point. The depreciation is a cost. Can anyone speak to how the solar panels work when the rest of us on CL&P have the grid knocked out? (Pick your reason, fallen tree, hurricane, rainstorm, car accident, etc…) It seems that the power grid is becoming less stable than in the past, we’ve had several outages this year even, before the storm season kicks in! If you lose the CL&P feed…solar is out too! They are a “combo” situation. I participated in the Solarize Westport program in 2012. My system was installed in Jan 2013 by Enron at a total cost of $7000 after incentives and tax credit. Hurricane Sandy downed several of my tall pine trees that were scheduled to be removed for greater southern exposure. Sometimes a plan comes together! My CL&P bill runs on average $75 per month and that includes air conditioning in the summer. My lowest bill so far was $16 when I sold back power to the grid. My total electrical bill has been reduced by 50%-60%. I decided to install solar panels for economic and ecological benefits. How big of a system did you get? I just got quoted a cost of $17k for a 9.5 kWh system through the current Solarize Westport program. Incentives have gone down but do has the cost of the equipment. What I know won’t go down in the future is the cost of CL&P’s price per kWh. I am leaning towards going forward with the installation.